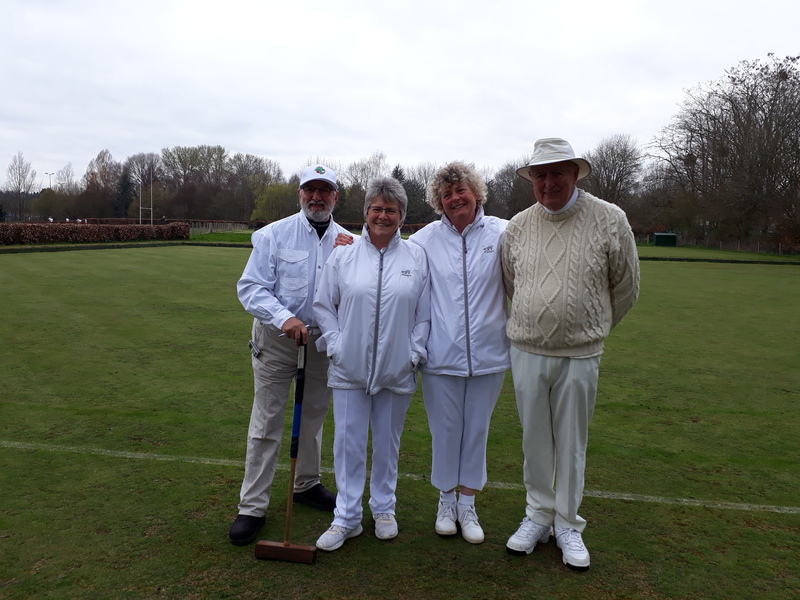 On Wednesday 20th March, four Ealing members – Ron Carter, Bridget Goodman, Harry Midgley and Jane Powell – took part in the final of the South East Croquet Federation GC Handicap tournament against Littlehampton, but on neutral ground at Guildford and Godalming. The weather was unkind in temperature, but dry at least! By the end of the first session we had won four of our six games, so we needed just one more to win. Ron and Jane then played doubles and lost 7-5, whilst Harry and Bridget fought out their singles games, Harry losing 7-6 and Bridget winning 7-5, meaning Ealing had won! Most of the games were won or lost by 7-6 or 7-5, so good games were had by all. Littlehampton were great opponents and our thanks to them for such close games. Thanks should also go to Guildford and Godalming Croquet Club for agreeing to host this event, and supplying us with hot soup, bread and cheese.